Every year in the past I have provided readers several non-traditional holiday cookie recipes that are great to offer on holiday dessert tables or pass at holiday related functions. These non-traditional cookies help bring variety to the plethora of sugar cookies typically found decorating dinner tables or being passed at holiday affairs. I am not in any way discounting a sugar cookies worthiness of being served during the holidays as I too love them and look forward to my mother’s every year. However, I do like to try new things and venture outside of the typical so it is always nice to have something new alongside of a childhood favorite. With that said, I slacked this year and only brought readers one non-traditional offering and it wasn’t even a cookie, it was the Greek jam tart Pasta Flora. I did make several cookies during the holidays that most families would not consider part of the norm so I would like to share these with you. Although you will not have the time to make them for any holiday this year as they have all since passed, perhaps you may try them now and decide if you would like to offer them next year at your holiday events. 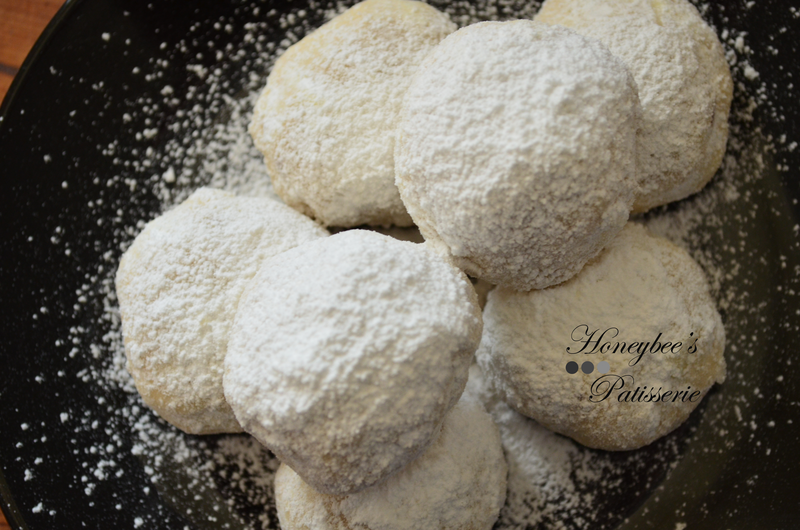 The cookie for this entry that I am anxious to share is a classic Christmas dessert staple for Greeks and is known by the name Kourabiedes. These festive, soft delights are butter cookies drenched in the sweetness of confectioners’ sugar (also known as powdered sugar or icing sugar). My daughter devoured so many to the point I began to doubt the study that confirmed sugar does not make kids hyper. Along with attracting kids like a magnet, they are very easy to prepare and will add the perfect holiday theme to any table with their snowy appearance. Preheat oven to 350º. Line two baking sheets with parchment and set aside. Using a stand or hand mixer, beat the butter and confectioners’ sugar together until it becomes light and creamy. Add the vanilla and ouzo/brandy, mixing until just incorporated. Add the toasted almonds and again mix until just incorporated. In a large bowl, sift together the flour and the baking powder. Do not skip this step as it is detrimental to the final texture of the cookies. Slowly add the sifted flour mixture to the creamed butter in 3 additions. Mix together until the dough is combined, soft, and easy to work with. If the dough appears too sticky and hard to work with, add up to no more than 2 ounces of sifted flour until the desired texture is achieved. To form the Kourabiedes, roll 1 to 2 tbsp. of dough into a ball between your palms and place on the prepared baking sheet. In the middle of the cookie dough ball, push down with your finger to form a small dimple in the surface. Repeat with the remaining dough, leaving at least 2 inches between each cookie on the baking sheet. Bake cookies for about 20 minutes or until they take on a very light golden hue. Do not overcook them as they should not look golden brown. Remove the cookies from the oven and allow to cool on the baking sheet for at least 5 to 10 minutes. Do not try to remove them from the sheet immediately as the cookies will break if they are still warm and they will not be thoroughly cooked. Once the cookies have cooled, remove them from the baking sheet and place on a wire rack to cool completely. Continue forming Kourabiedes as in step 4 until all the dough has been used. Once all the cookies have cooled completely, place a few cups of confectioners’ sugar in a large bowl. Working in batches, roll the cookies in the sugar so that the sugar coats on all sides. 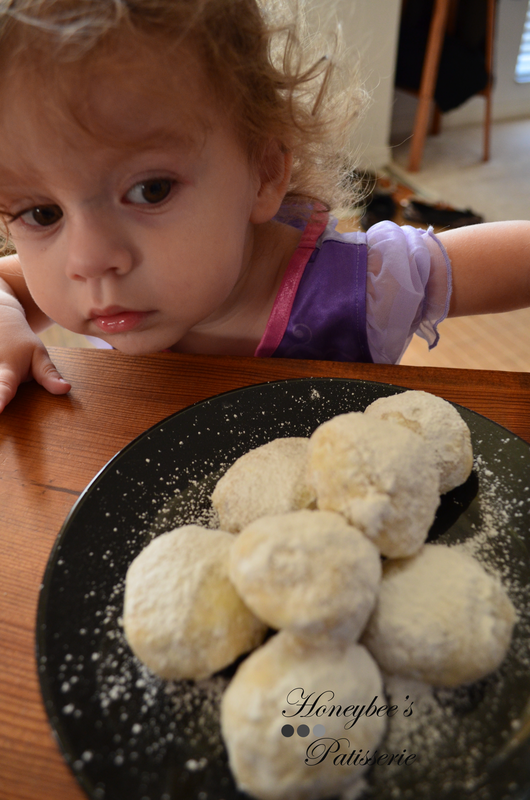 Before serving, place the cookies on a platter and sift a generous amount of confectioners’ sugar over the cookies.